The Irish Architectural Archive was established in 1976 to collect and preserve material of every kind relating to the architecture of the entire island of Ireland, and make it available to the public. With well over 1,000,000 items in its collections ranging in date form 1690 to today, the Archive represent the greatest single source of information on Ireland’s buildings and those who designed them. 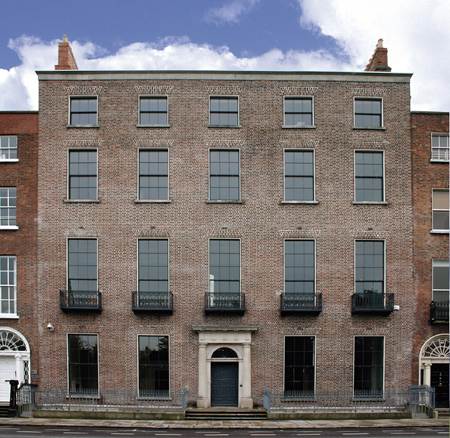 The Archive is located at 45 Merrion Square in the heart of Georgian Dublin, and is open to the public from 10 am to 5 pm, Tuesdays to Fridays. Built c. 1795, No. 45 is the largest terraced house on Merrion Square. The Office of Public Works carried out an extensive programme of works to the house from 2002 to 2004, including the refurbishment of the historic fabric and the construction of new state-of-the-art archival stores to the rear. Original features include a generous light-filled entrance hall, a very fine Portland stone main staircase, and highly-refined neoclassical plasterwork by Michael Stapleton. Public areas include the Archive Reading Rooms on the ground floor and the Architecture Gallery where an exciting programme of exhibitions makes the treasures of the Archive’s holdings accessible to all. On the first floor is a suite of interconnecting reception, meeting and lecture rooms. These facilities are available for hire. The building is universally accessible.